Start by blending the almonds in a food processor so that it turns into a flour like consistency, then set aside in a bowl. Then place the dates into the food processor and blitz up until they form a sort of sticky paste. Add the almonds back in along with the oats & maple syrup and pulse until all ingredients are fully mixed together. Take a handful of the sticky mixture and press into greased (with either sunflower oil/dairy free butter) oven proof dishes. Bake for 10-15 minutes - Whilst the bases bake in the oven, slice the cherry in half, twist and pull - that way you can get the stone out easily. 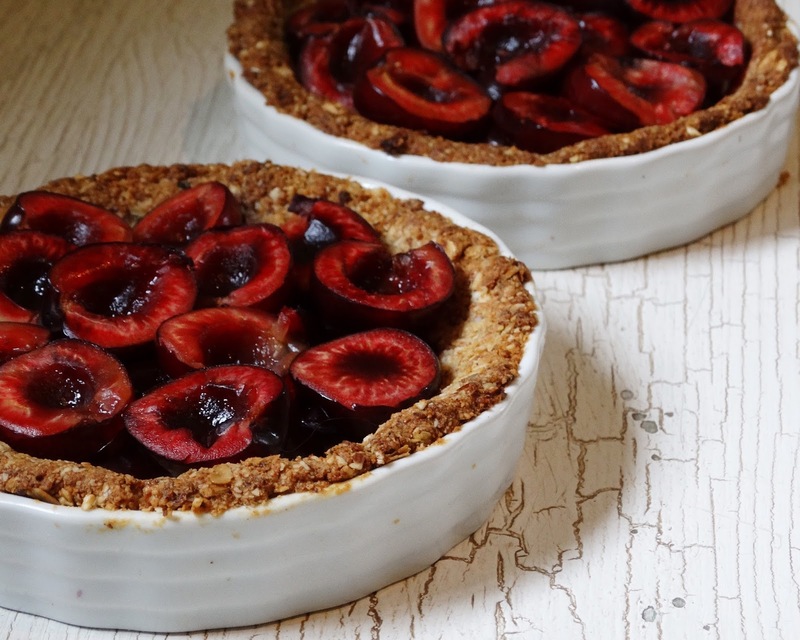 Place half of the cherries into a non-stick saucepan with the agave nectar and a dash of hot water, this will allow the cherries to soften and creates a sort of compote to add to the tart for a soft textured layer. Take the bases out of the oven once they have been baked, add in your compote long with the rest of your sliced cherries and then pop back into the oven for a further 5-7 minutes. Allow to cool for about 5 minutes as the fruit will be extremely hot, then tuck in with some soya cream or dairy free ice-cream. Hope you enjoy the cherry version!